Tito Mboweni sworn in as new Finance Minister - SABC News - Breaking news, special reports, world, business, sport coverage of all South African current events. Africa's news leader. Former Reserve Bank Governor Tito Mboweni is the new Finance Minister of South Africa. 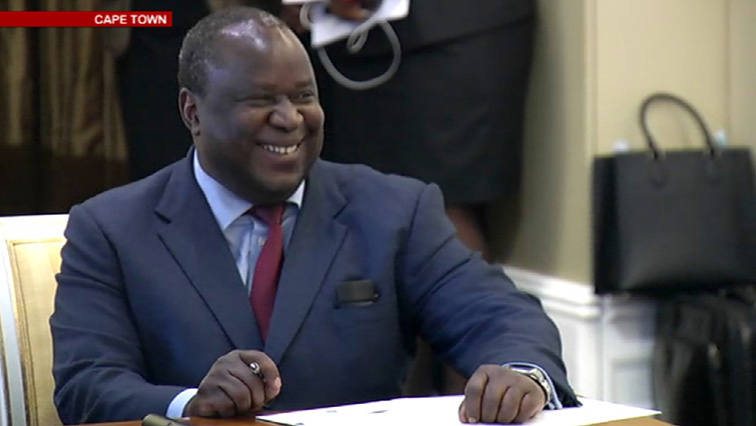 President Cyril Ramaphosa has announced former Reserve Bank Governor, Tito Mboweni, as the new Minister of Finance. This comes after Ramaphosa accepted the resignation of Nhlanhla Nene. Ramaphosa addressed the media at Tuynhuys Media Centre in Cape Town. The rand is currently trading at 0.67% stronger at R14,75 after Ramaphosa’s announcement. It is the first time it has reached below R15 in October. This entry was posted on 09 Oct 2018,05:22PM at 5:22 PM and is filed under Business. You can follow any responses to this entry through the RSS 2.0 feed. Both comments and pings are currently closed.